As Germany commemorates the 70th anniversary of the end of World War II and the Holocaust, we have an opportunity to reflect on life in the immediate postwar period for the youngest victims: Jewish displaced children. This essay is one example of a growing contingent of young German historians and social scientists who focus on Germany’s Nazi past and its consequences. By the end of the Second World War, approximately one and a half million Jewish children and adolescents had fallen victim to the National Socialist race and extinction measures. Only about 180,000 children and adolescents survived, for example in concentration camps (very limited), in hiding with non-Jewish families, in monasteries, in partisan units, or in the Soviet Union. 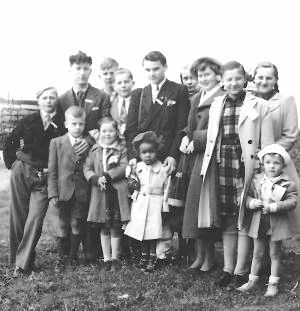 After the war, many of these child survivors found themselves without accompaniment of a parent or a near relative and outside of their home countries, often on German territory. The necessity of giving these orphaned and unaccompanied children shelter and food was obvious. We have written other blogs about the work Julie’s father did in post-war Germany with displaced person and her mother’s thoughts about the plight of the refugees who by then had been homeless for more than three years.